Understanding the quality and reliability of a solar panel and the company behind it isn’t easy. The brands are mostly unfamiliar, and all solar panels look practically the same. For this reason, the solar industry has developed a ‘tier ranking’ system to help guide buyers and financiers on which solar panel manufacturers are ‘bankable’. Tier 1 solar manufacturers are the most bankable, and Tier 3 the least. ‘Bankable’ means that a solar-farm developer using that manufacturer’s panels is likely to be offered financing by banks for the millions of dollars they need to build the facility. Banks don’t usually lend millions of dollars without doing their research, so the idea is that if you choose a Tier 1 solar panel manufacturer you’re buying a brand that the banks trust enough to lend millions of dollars against. For obvious reasons, a panel manufacturer’s ranking is a matter of great pride and is highly valued. It’s a complex task to rank the many hundreds of manufacturers and a lot is at stake. Meaningful rankings are published by a small number of independent industry analysts. Due to the effort involved and the importance of the information, the rankings are generally not openly published. Instead, they are sold as industry intelligence. Last time I checked, it cost $30,000 per year to subscribe to the most popular list: the Bloomberg Tier 1 Rankings. Ouch. To make it harder for us Aussies, these expensive reports are based on an international ranking, not an Australian ranking. To add another level of complexity, a few non-Tier 1 manufacturers sell what I believe are top-quality panels in Australia. Why aren’t they Tier 1? Generally, it’s because they’re ‘boutique’ manufacturers who contract panels for the Australian market using Tier 1 manufacturers. In one case (Tindo Solar), the company is an Australian-based manufacturer who is simply not big enough to be classed as Tier 1, despite producing very high-quality panels. All this means that the international Tier 1 lists – although a good tool – are not perfect for Australian purposes. They miss some great brands off, and they include some big brands that I wouldn’t recommend due to poor Australian support or quality that isn’t suited to Aussie conditions. You should also be aware that, as I’ve described, Tier 1 rankings are not based on panel quality directly. The ranking organisations don’t even look at the solar panels or their manufacturing lines to gauge the quality. I do consider them as a proxy for quality, though: if a panel manufacturer is always being used on massive solar farms by highly experienced developers, they’re highly likely to be good quality. You can’t trust the Tier 1 lists blindly. They need to be taken with a pinch of salt and an eye to local Australian circumstances. 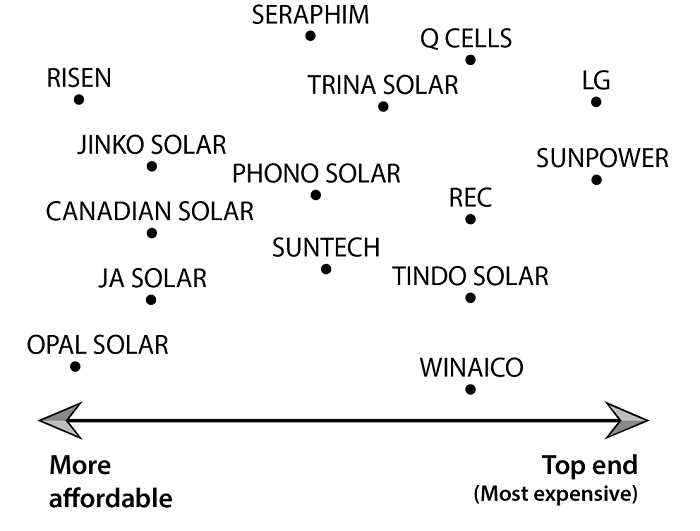 For that reason, I’ve put together a chart showing Tier 1 and exceptional Tier 2 solar panels that I consider worth buying. The simplest way to avoid putting crappy panels on your roof is to make sure you use a panel on my list – see Figure 5.6. If your installer can’t provide one of these brands, you’re venturing into the unknown. Panels to the left are cheaper, but they’re likely to produce 5% or so less energy and not last as long as the panels on the right. In general, the solar panels on the right are also more efficient, which means they’ll take up less space on your roof for every watt generated. Figure 5.6 Reputable and well-supported brands of panel in Australia. 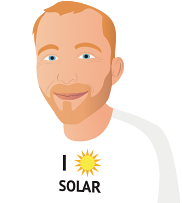 Go elsewhere – there are hundreds of good solar installers in Australia who do offer these brands! Don’t take the solar company’s word for it –‘This is a Tier 1 panel, mate, don’t you worry!’ It’s common for the ultracheap mobs selling Tier 3 and 4 junk to claim their panels are Tier 1 and better than all the rest to get the sale. If it isn’t on the chart, be extremely careful. Think about why the salesperson might be pushing an obscure panel brand. It’s because they’ve got a good deal on it. The only reason to take a risk with obscure panel brands is price, so the salesperson’s judgement is anything but objective. When it comes to the chart, there’s no ‘master list’ of reputable panels that everyone agrees on. This is my list based on extensive research and, yes, my personal opinion. There will be good solar panels that are not on this chart, that I simply am not familiar enough with to offer an opinion. There is no guarantee that a panel from a company on this list won’t fail during the warranty period. Even the best companies make mistakes, and today’s good solar panel companies have had quality problems in the past. If you do need to claim on warranty, though, these companies are more likely to have the infrastructure in place in Australia to handle your claim easily. Neither is there any guarantee that these companies won’t go broke. Big companies do go broke, for lots of reasons, and companies ranked as Tier 1 have gone bankrupt before. What I’m saying is that the chart is an indication of good quality and reasonable financials. It’s the best way I know of choosing a good solar panel and reducing the risk of buying a low-quality panel from a company that won’t be around to service the warranty. Buying a panel brand that isn’t on the chart is taking a big risk to save a few hundred dollars on a system that will be on your roof for decades. Here’s the thing that blows me away. On a good-sized 5 kW system, the difference in price between the cheap panel of unknown quality that could have been put together by anyone and the Tier 1 panel built by robots in an internationally accredited, quality-assured, spotless factory (drum roll, please…) starts at about $600 on a $6,000 system. That’s an extra $600 for the peace of mind that your panels will generate safe, clean power for the 30 years they’re on your roof. You may move home a couple of times in that time, but I strongly believe we all have a duty of care to every family that may own a solar-powered home. It blows me away that, for the sake of $600, people are choosing Tier 2, 3 or 4 panels and risking their investment going up in smoke (sometimes, literally). Every solar installer I know sleeps much better at night when they install quality panels than when they fit the budget panels that they may carry as an option for the people who insist on screwing them down to the last $100. If that’s true, why do some solar companies only offer the Tier 3 (and worse) junk? Because, unfortunately, they’re in a race to the bottom. They need to have jaw-droppingly low prices on their TV and newspaper ads to get calls from people who are looking for the lowest prices, so they’ll cut costs wherever they can. The problem for these companies is that in their race to the bottom, they might just win.